Tee off with a foursome of the big screen's funniest clowns as the greens keeper starts World War III against a gopher during a sidesplitting round of fairway foolishness. 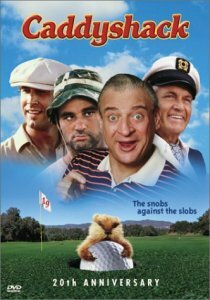 Caddyshack on DVD is a can't miss for any golfer's movie collection. From Rodney Dangerfield of Westport, Connecticut on 4/6/2003 . What a classic. A must own for every golfer and non-golfer alike. 5/28/2003 – Does the Caddyshack DVD have any bonus footage? Response From FirstFairway: Sorry, the Caddyshack DVD does not have any bonus footage. It is basically the same as the VHS version.